At the age of 8, Olivier Giraud already yearned to be on stage but, as far as his parents were concerned, earning a living as a comedian was beyond his reach. Olivier decided to put that passion on the back burner, knowing full well that one day he would come back to his first love: the stage. In 2001, Olivier packed his bags. His destination was the United States. He obtained a six-year visa and soon became Maître d’ at one of the most prestigious hotels on the East Coast: The Breakers in Palm Beach, Florida. And yet his childhood dream remained intact so he decided to return to Paris and try his luck in the spotlight. During his time working in service, he used to have a chuckle over the cultural contrasts between Americans and the French. Then one day he came up with the idea of writing a one-man show about all these differences. 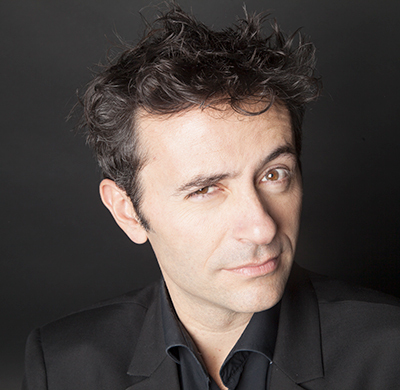 Olivier made a bold choice and wrote his show in English in order to be able to have an audience made up of spectators from all different horizons. He presented his project to numerous showbiz professionals looking for their support but they all seemed to think it was doomed to failure. Since no one was prepared to take a gamble on him, he decided to put together his own production company: French Arrogance Production. May 10, 2009, “How to become a Parisian in One Hour?” was performed on stage for the first time. 500,000 spectators later, Olivier Giraud decided to celebrate the success of this adventure on May 20, 2016 with a performance at the OLYMPIA!